Back in March of 2014, HTC chose to unveil its most recent flagship, the One M8, in New York and London, at its own dedicated event. For whatever reason, the company obviously didn't feel like an announcement at CES (January) or MWC (later in March) was appropriate, and according to @upleaks, HTC may be planning a repeat of that arrangement with the oft-rumored Hima (One M9). If you're just catching up on Hima, here's what we know so far. The device will have a 5-inch 1080 x 1920 resolution display (though a 5.2- and 5.5-inchers have also been suggested), a quad-core, 64-bit Qualcomm Snapdragon 810 processor, 3GB of RAM, a 2840 mAh battery, and surprise-surprise, a 20.7-megapixel camera (likely by Sony). That's right, it would appear that HTC may very well be ditching the UltraPixel tech that's been keeping its devices a step behind competitors, and that's definitely good news. The One M9 is expected to come in the typical HTC color palette: Gray, Silver, and Gold. More as we get it, folks! If what up leaks is reporting is true, I'm not sure if I'm looking forward to this. Why not? It has pretty much all high end hardware. I am just wondering. However, I'm excited for the camera if that's true. Battery could be a bit bigger. I was at least hoping for 5.2 inch or at the most 5.5 inch. If not at least another 5.5 inch model but sadly the chances of that seem slim. And although QHD is still raw, I'm a forward thinking man. 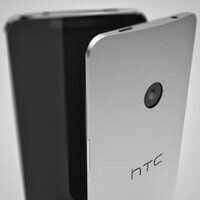 Would have been sweet to see HTC tame QHD. I'm agree with you on the battery... that is a bit weak. I think screen size is okay and will be acceptable for a lot of people. My Z2's 5.2" screen is just a bit too big for my one hand use. But once again, that's personal preference. I think HTC should stick with 1080p if they are putting such small battery. There is no need to have a beautiful display to drain your battery that quickly. I had 4k tv for 2 weeks and I can't find any 4k content to watch on it beside some short youtube video. 4K is 2 year down the road IMO and internet speed needs to improve overall (cable and cellular) before the big push for 4k. For me personally, I don't worry too much about one handed use. I usually find myself instinctively using two hands for operation on my 4.7 inch Droid, but as I said it's a personal preference. If they go with a small battery, then keeping QHD out is a wise choice. I think QHD is 2K, correct me if I'm wrong. I actually thought 2K resolution is beautiful, I'm actually starting to find more and more content for 2K which is great. Overall if HTC keeps the design of the M8 in the M9, I might bite the bullet and go for it. When I held the M8 in my hands the feeling was the best I've experienced from a smartphone. Just hoping they stick with front facing speaker and their premium design. Also remove the logo. Seriously! Come on, be next best camera phone. I'm glad there will be a flasgship caliber phone with a 5 inch screen but they need to work on their bezel situation. Sounds like that's taken care of with the 20.7mp sony camera that's supposed to be in this device. HTC has good image processing, just not great hardware(as far as cameras go). I'll be keeping an eye on this device for sure. Flagships should be 4.5 to 5 inch only. Can't agree with you anymore, Note series changed it all. I like what I red so far. Just hope they will remove that ugly HTC black bar from bottom of the screen. If they do probably it will be mu next phone. Just dont f**k up with camera this time. I would like to see a Snapdragon 810, 3GB of RAM, 3300 mh battery, 20.7 mpx camera with OIS, 2560x1440 p on a 5.5' IPS display, at least 32GB of storage and all the rest of HTC goodies. I don't like the way the camera is positioned in tbe back. It looks bland. Hima Time! Now break it down na! Please don't bash ultra pixel,they perform great in low light. Just increase the mp in up. And battery not less than 3000 mah. Well they might as well use the opportunity and also ditch Sense. If you don't like Sense you can get a launcher or a custom ROM. Most of my friends and I agree that Sense has the best looking UI.